Today, I am taking pause from the creation of our 'little boy and his gypsy moth' to introduce to you a new Scarlet Elfcup pattern. As they say, "old habits die hard." After the creation of Pip and Goosey Mae, I was really yearning to make a baby in the Wee-Bee Mini Elfcup size. Hence, reverting back to the dolls that I love...the lil'uns. So, here we have it...a 6" (15 cm) itty-bitty baby. I'm quite certain now that I've fallen rather hopelessly for the small ones. I feel so smitten with making these little darlings that I can't seem to move myself beyond their world. The 6" Wee-Bee Baby Elfcup is a hybrid between the 6" Wee-Bee Mini Elfcup and the 16" Baby Pip. The 6" Baby Elfcup features a tiny sitting doll with permanently curved knees that allow for a very open sitting position. 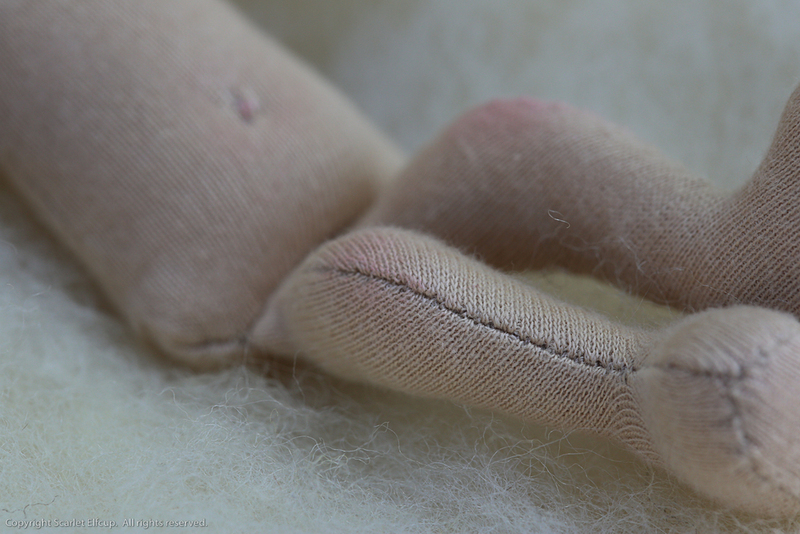 Other than that, all other features of the doll are standard...shaped feet, hands with thumbs, a belly button and buttocks. One slight exception in the belly...it is stuffed to be pudgier than usual in order to give a rounder middle for the baby. 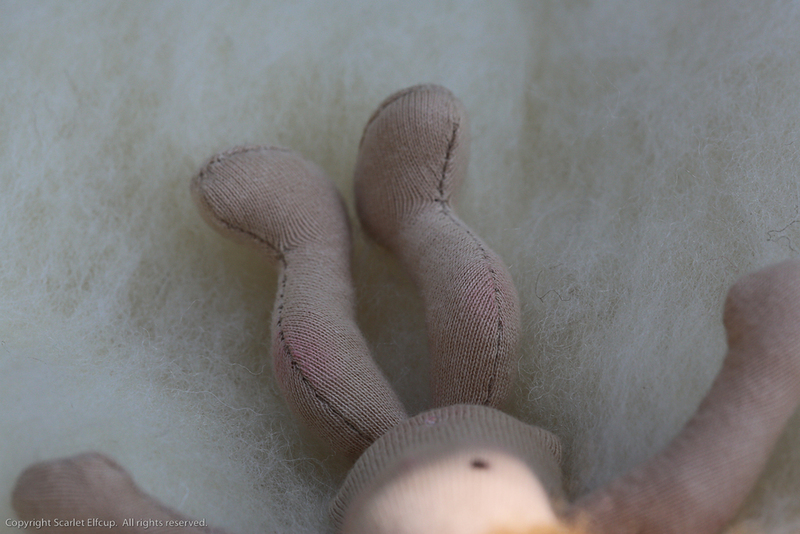 The Baby Elfcup will come with the standard options for facial structure (sculpted or unsculpted) and hair fiber (mohair yarn or a number of natural fleece locks). The 6" Wee-Bee Baby Elfcup....another tiny Scarlet Elfcup creation, fit for the palm and tiny pocket snuggles. The first of the 6" Wee-Bee Baby Elfcups will be featured in a doll made to stock with The Enchanted Toybox. Time and date of the upload will be announced next week. So, stay tuned. Thank you and have a lovely lovely April day!